2. 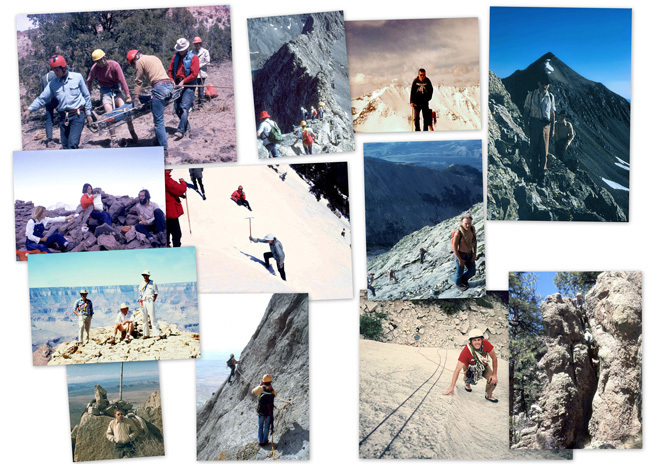 Founding and Organization of the Los Alamos Mountaineers Club. 5. Adventure and Exploration at the Brazos Cliffs. 6. Shiprock and the Los Alamos Mountaineers. 7. The LAM Climbing School. 8. Discovery of the White Rock Climbing Areas. 10. Search and Rescue Activities. 12. A New World of Canyon Trips. 13. Exploring the Grand Canyon. 14. Climbing Trips to the Northwest, Yosemite, and other Areas. 15. Climbing Trips to the Northwest, Yosemite, and other Areas. 17. The New Age of Broken-Down Baby Boomer Trips. 18. Some of the Years' Most Memorable Programs. 21. Climbing Equipment - A Matter of Perspective. 22. Past & Present LAM Activities, including full activity details back to 12/2006. 24. Los Alamos Mountaineers Historical Binder (30MB pdf). Information from 1967 to 2003. 25. Click here to add material or suggest a new topic to Norbert?